SANTA CLARITA, Calif. (April 24, 2018) – Destination lovers seeking new worldwide travel experiences need to look no further than Princess Cruises and the cruise line’s 2020 World Cruise. Offered on the intimate 670-guest Pacific Princess, cruisers will visit 42 destinations on five continents and come back holding once-in-a-lifetime memories from around the globe. 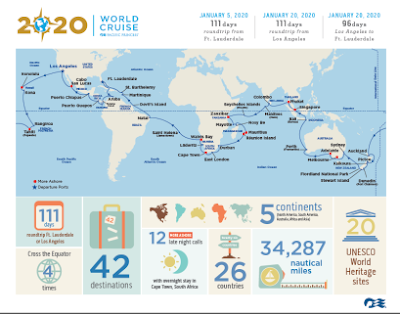 Due to popular demand of the 2019 World Cruise, the 2020 111-day roundtrip voyage offers similar routing to the 2019 cruise, including South Africa and departs Ft. Lauderdale on January 5, 2020 and Los Angeles on January 20, 2020. Princess Cruises also offers a 96-day Los Angeles to Ft. Lauderdale segment, departing Los Angeles on January 20, 2020, as well as shorter, multi-day segments along the journey. The 2020 World Cruise aboard Pacific Princess goes on sale on Wednesday, April 25, with rates starting at $22,999/person. Guests booking the 96- or 111-day World Cruise before March 31, 2019 receive early booking perks such as a $1,000 onboard credit per person for guests booking a balcony, mini-suite, Club Class mini-suite and suite; $500 onboard credit per person for guests booking an interior or oceanview and complimentary gratuities for any category. Past Princess guests are also eligible for a savings of up to $1,000 per person. More information about the 2020 World Cruise is available at www.princess.com/world. Three new Royal-class ships are currently on order with the next new ship, Sky Princess, under construction scheduled for delivery in October 2019. The company is part of Carnival Corporation & plc (NYSE/LSE: CCL; NYSE:CUK).